Tazawako Beer Akita Bakushu Megumi is a 4.5% golden ale from Tazawako Beer, based in Akita, Japan. It’s part of their autumn seasonal lineup and can be found in bottles and on tap across Japan when on sale. Tazawako Beer Akita Bakushu Megumi was co-developed with Akita Prefectural University and is the first beer to be brewed using only ingredients from Akita. It’s brewed using two-row barley for a clean refreshing taste and six-row barley for a mild taste and also to impart a slight bitterness, both from the local Ogawa village. If you’ve read our review of Tazawako Beer Weiss then you’ll know that Tazawako Beer Akita Bakushu Megumi also uses locally sourced yeast as well. An interesting 100% Akita beer. Tazawako Beer Akita Bakushu Megumi poured out a hazy copper colour with a light, frothy, white head on top that faded fast to a few bubbles around the outside of the glass. It had a slight yeasty bready aroma with some hints of citrus and honey, though an underlying grassy tone also came to the front. Tazawako Beer Akita Bakushu Megumi has some sweetness from the malts, with a subtle caramel and grainy edge coming through when Tazawako Beer Akita Bakushu Megumi had warmed up. The bitterness was the first initial sensation when I drank Tazawako Beer Akita Bakushu Megumi but there was a lack of hoppiness – a shame considering the aromas that were coming through. It had a clean taste to it, with the yeasty bready flavour only really coming through towards the end of drinking and once Tazawako Beer Akita Bakushu Megumi had warmed up a lot. 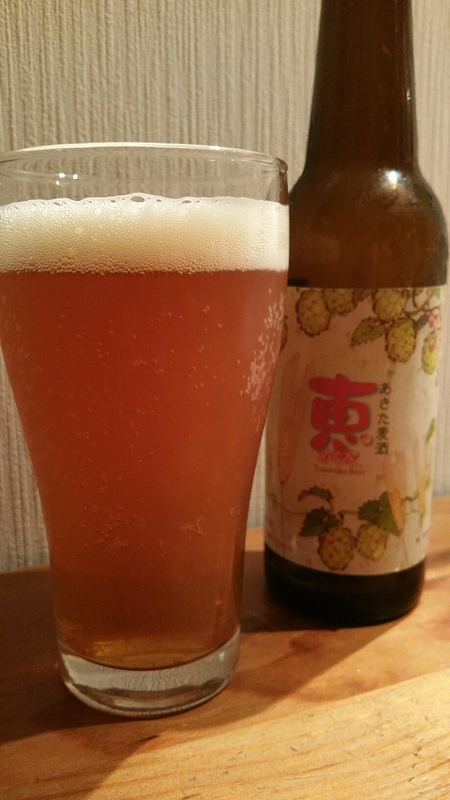 Moreover, Tazawako Beer Akita Bakushu Megumi was quite dry and refreshing but that wasn’t enough to save it. Tazawako Beer Akita Bakushu Megumi is an ok beer but nothing worth searching out for, considering the price.